“Citizen Kane” may not be my favorite movie of all time. However, the claim that it is the greatest movie ever made is completely warranted. There is something about revolutionary movies that causes the Academy to not reward them Best Picture. Instead, “How Green Was My Valley” won that year, giving people the only possible reason to ever hate John Ford. To this day, Orson Welles’s experiments with the camera, and his radically non-linear story-telling, are as fresh today as they were in 1941. Without “Citizen Kane,” the most revered filmmakers of our time would not have made some of their best work. The snub of “Citizen Kane” set the unfortunate precedent for voters to choose safe, comfortable stories over those that actually had an impact on the artform or were actually, well, good. It really is time for the Academy to stop letting old white people choose all of the winners. “I don’t have to show you any stinking badges.” It’s hard to believe this classic was passed over for Best Picture, especially when John Huston took the Best Director trophy for this film. “Hamlet” ended up being the winner in 1948. No disrespect to the Bard or Laurence Olivier, but “Hamlet” adaptations seem to come and go every few years. 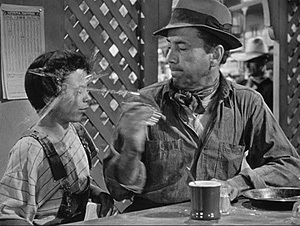 “The Treasure of the Sierra Madre” is something that could never be repeated. Sure, that beheading at the end looks really fake, but Humphrey Bogart gave one of the best, most despicable performances of his career. Maybe the Academy just couldn’t deal with a protagonist this reprehensible. “The French Connection” took home the gold in 1971. It was certainly a daring choice back then, and the car chase scene still goes pretty unmatched. However, that movie has lost some of its luster in the sea of cop thrillers that have been made ever since. Over 40 years later, “A Clockwork Orange” is as intriguing and audacious as it was the day it first came out. It would still create a stir if it was released today. The Academy never honors movies like “A Clockwork Orange,” but they would be a lot cooler if they did. Some people called 1939 the banner year for movies. The real banner year was 1976. That year’s Best Picture winner, “Rocky,” is a classic in many ways. It’s a nice movie, it’s about the underdog overcoming the odds. I like that idea, I always root for the underdog. However, when the Best Picture category also includes Martin Scorsese’s unflinching masterpiece “Taxi Driver,” the seamless political thriller “All the President’s Men,” and the still relevant to this day satire of “Network,” you’ll realize that you were rooting for the wrong underdog. 1979 was the rare year that the Academy chose a small, socially aware drama over a big epic for Best Picture. “Kramer vs. Kramer” was the first movie to handle divorce so honestly. The big catch is that it beat “Apocalypse Now.” “Kramer vs. Kramer” is a very good movie, but “Apocalypse Now” is the kind of magnum opus that only comes around every once in a while. Upon its initial release, Francis Ford Coppola’s meditative take on Vietnam was not regarded as the masterpiece it is today. The film was likely still recovering from all of the bad press revolving around its infamously disastrous shoot. Claims of the film’s greatness are undisputed today. With the passing of time always changing perception, perhaps an award like Best Picture is pretty useless. How do we know what will be the true Best Picture years down the road? Hailed by many as one of the greatest movies of all time, “Raging Bull” probably suffered from boxing movie fatigue at the time (thanks for that one, “Rocky”). There is no way that anyone could not admire this movie. Everything from its boxing sequences, which are as violent as they are beautiful, and the performance by Robert De Niro, a monster in everyman’s clothes, is a cinematic achievement. “Ordinary People” might have won the gold, but only “Raging Bull” would end up on most critics’ lists of the best movies ever made. I have not seen “Dances With Wolves,” so I cannot make fun of it as much as I would like to. One day, my cousin described a movie starring Kevin Costner as “reeking of Costner.” I’d like to think “Dances With Wolves” is the same way. But I digress. 1990 saw a safe, politically correct big frontier movie sweep the Oscars while Martin Scorsese’s shocking, hilarious, and radically different “Goodfellas” took a backseat. Scorsese’s mob classic got the last laugh though: when’s the last time you saw someone incessantly quoting “Dances With Wolves”? 1994 was the year that “Forrest Gump” won basically every award in its path. It is certainly a hard movie to dislike. However, that year also included “Pulp Fiction.” One movie was a heartwarming story about a mentally challenged man overcoming the odds and finding love. The other revived the career of John Travolta, re-wrote every rule of writing a screenplay, and inspired a million knockoffs that could never match it. The battle between “Forrest Gump” and “Pulp Fiction” is the classic battle between the safety of traditional Hollywood, and the radical change of New Hollywood. “Forrest Gump” might have won the Oscar, but more people have a “Pulp Fiction” poster hung up on their wall. Choosing one scene to represent this movie is nearly impossible. This one makes me happiest. There is no way a movie like “Fargo” could ever win Best Picture. Yet, it could. Sure, its totally snarky. Sure, its intensely violent. Sure, a guy ends up in a wood chipper. But in the end, it has one of the most moving and affirming touches of life you’ll get to see in a movie, shared in such a brief moment. Movies like this should be winning Best Picture more often. And the final, most recent, perhaps most infuriating case of Old Hollywood pretending they can stop New Hollywood with a naked golden man. “The King’s Speech” is a fantastic movie that tells a moving story and has some pitch perfect performances. But it wasn’t “The Social Network,” which became the first movie to so accurately pin the Internet Age. “The Social Network” itself is about a group of guys who fought the system and toar down age-old institutions. That is probably what the Academy was so afraid of, and why they passed up another movie that is already being hailed as a modern masterpiece. Hell, many other choices would have been better than “The King’s Speech” that year. Might I remind you that “Black Swan” was also nominated. This entry was posted in Academy Awards, Oscars, Top 10 on February 21, 2012 by ian0592.